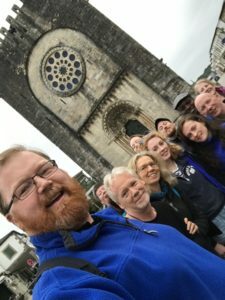 It was an intrepid group of pilgrims who set out on the Camino last month. Fifteen relative strangers were bonded together by a desire to walk to a different rhythm of life. We left behind the hustle and bustle of Cork, Dublin, and London for a week on the Way of St. James. It’s hard to describe the Camino. It is a somewhat ineffable experience that those who have walked it, no matter where they are from, how old they are, or whatever their faith perspective is, understand what it means. In many ways it is the perfect antidote to the rat race and its attendant stress that we have come to see as a virtue. Pilgrims here move with a new freedom, where each day they walk to the horizon with the rising sun at their backs, and when they get there they walk on to the next horizon. This year we had our largest group yet and everyone gelled well. The first day took us to the town of Sarria, about 110km from Santiago. It was an early pilgrim meal, followed with the group’s first attempt to get unpacked and settled down in the albergue dormitory with the lights off. It’s not for the faint hearted, but by Day 3 you could do it blindfolded There were, after all, about twenty other people in the room, some who had walked all the way from France and beyond. The next morning, we took off in high spirits. 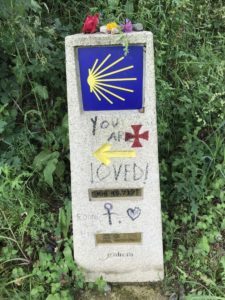 We stopped, as we did each day, for a short reflection point where the Camino crosses a train track, under a motorway. The most challenging aspect of the Way is learning to slow down and that crossroads is perhaps the best symbol of our need to leave behind the rush and allow ourselves to walk in a relaxed manner and be attentive to the world around us. The weather, well the weather could have been better. It’s saying something when Ireland is getting more sun and less rain than Spain. That said, we did not allow it to dampen our spirits. We winded our way across Galicia, following in the footsteps of pilgrims who followed the same route for over a thousand years. 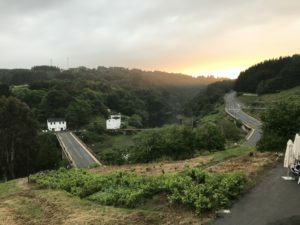 We walked through Portomarin, with its flooded village and transported church, Palas de Rei, where we had an amazing sahred meal, Ribadiso, where we stayed in restored medieval albergue, before going on to O’Pedruzo, just outside Santiago de Compostella. 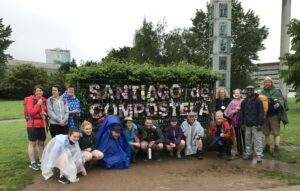 Arriving into Santiago de Compostella slightly weary, but delighted! On the Sunday we walked the last 20km into the Cathedral of St. James. It was an emotional experience, coupled with a real sense of gratitude. The noon Pilgrim Mass was an opportunity for thanksgiving for where we had come from and those we were going home to. 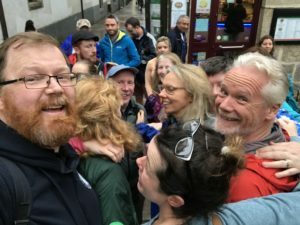 We were fortunate to meet wonderful people along the Camino, including a trio of fantastic teachers from Donegal and an amazing couple from Cork. We had the Sunday and the Monday in Santiago to relax, look after the feet, and explore the city. We tried out a number of their tapas bars, misunderstood the menu and ended up ordering far too much food. Thankfully we rose to the occasion. You would be amazed what you can put away after five days walking. On the Tuesday it was time to depart and return home, hopefully brining with us a sense of peace and tranquillity. On the outside of one of the doors of the Cathedral the symbols carved in stone point to the reality that by arriving in Santiago your pilgrimage has ended, but now that you head home your Camino begins in earnest. Buen Camino!